It’s back to school and normality today for over 50 Royal Cork junior sailors who shared the thrills, spills and excitement over the last 4 days at the ISA Junior Nationals held in Howth last weekend. It will be a long time before we forget the nail biting final race of the laser radials with Cian Byrne and Seafra Guilfoyle on equal points, match racing each other around every mark. They gave it their all but there had to be a winner and well done to Seafra who now goes on to represent Ireland at the world junior ISAF’s in Portugal this summer. In the Laser 4.7s, Johnny Durcan took two bullets on the final day to finish 2nd overall, he will now be going to Oslo for the World Championships in July. 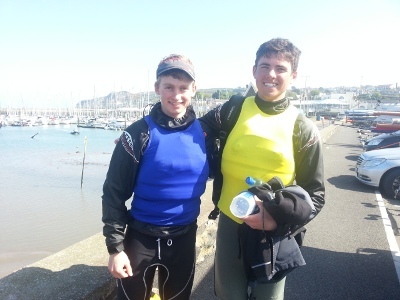 Well done to Adam D’Arcy and Ronan Walsh, who finished 4th and 8th respectively in the Topper fleet, who along with team mates, Lucy Donworth, Eoin O’Regan and Molly Murphy, will be representing Ireland at the Topper Worlds in Wales this summer. Royal Cork took 2nd, 4th, 5th and 6th positions in the 420s with Peter McCann and Arran Walsh, Harry Whitaker and Grattan Roberts, Cliodhna Ni Shuilleabhan and Jil McGinley, Dougie Elmes and Bill Staunton, respectively. There was to be no winners, that is the nature of the event, but congratulations to all our sailors who took part. It was a tough event, physically and mentally. 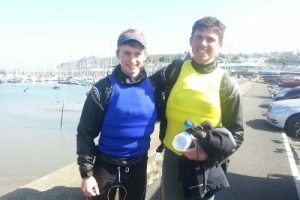 Well done also to the many parents who trailed the boats, washed the gear, and paid for everything! It was a great 4 days and the good news is, the Championship will be held in the Royal Cork next year.